Bridges can be a majestic representation of human achievement and some of them are impressive to look at. But they can also be associated with deaths or creepy incidents cause they’re just outright dangerous. The Seven Mile Bridge is a famous American bridge located in Florida. 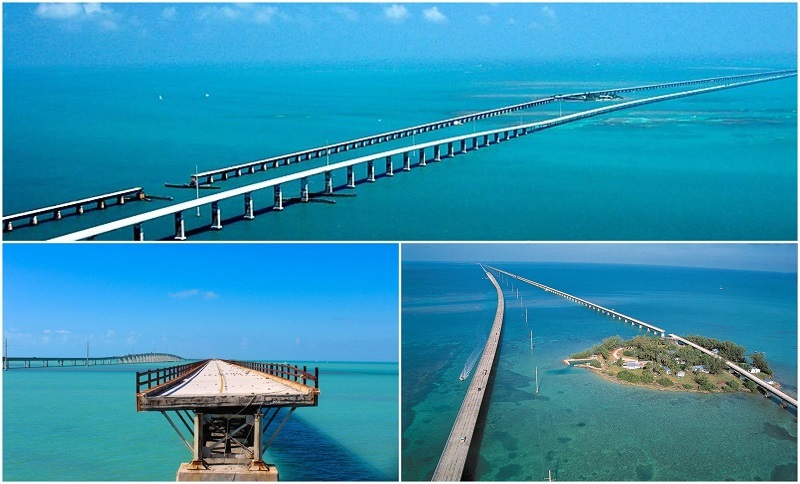 For a brief time in 1982, when it was built, it held the record for the longest concrete bridge in the world. To this day, it remains one of the longest on the continent. What’s scary about this bridge is that it’s very long, but also its high exposure to hurricanes, which is the reason the first version of the bridge didn’t last very long. 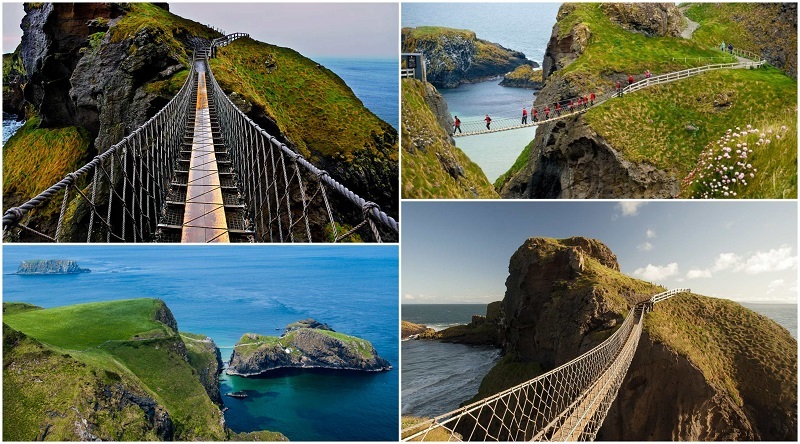 The Carrick-a-Rede Rope Bridge is a very small touristic bridge in Ireland. Originally, this bridge was used by fishermen for their salmon nets. Some courageous tourists do stunts here. Carrick-a-Rede Rope Bridge leads to the Carrick Island with natural scenic beauties. The current version of the bridge dates back to 2008. Sometimes, the walk back scares the visitors so much that they just take the boat. 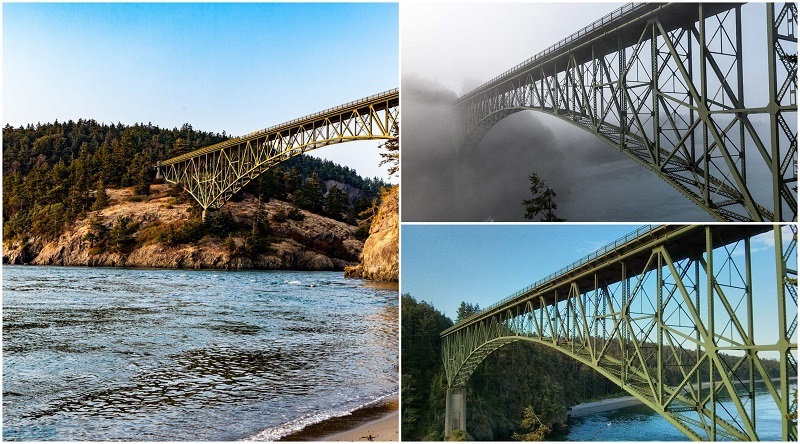 Deception Pass Bridge is a bridge in Washington you can either drive or walk on. The pedestrian lane offers a spectacular, yet scary view of the wild waters underneath. The passage opened in 1935 and it was built for trade and economic purposes. The Immortal Bridge is a very popular bridge located in China. It is one of the tallest and oldest in the world. It is believed that this natural bridge has been formed in the Stone Age. The Immortal Bridge is formed out of 3 large stones and some smaller ones; the Chinese people believe the main stones represent birth, renaissance and death. The scary yet beautiful thing about this bridge is the abyss that lies in its south. 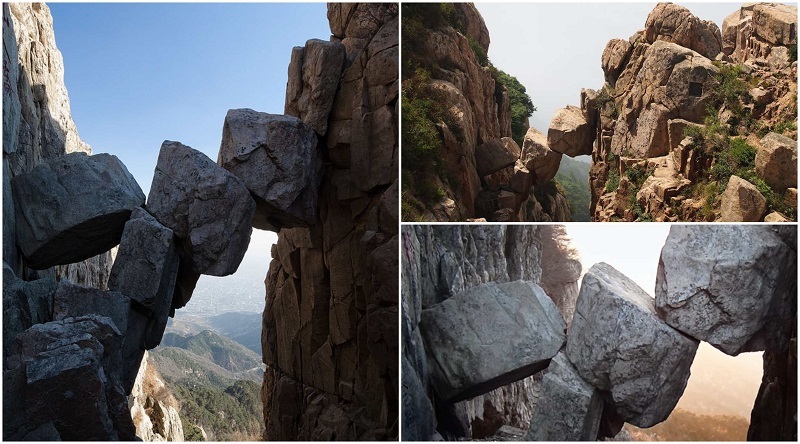 Hiking on the Yellow Mountains, where the bridge is located, is a very popular activity. This rather recent construction (2004) is suspended 100m into the air on just one pylon. 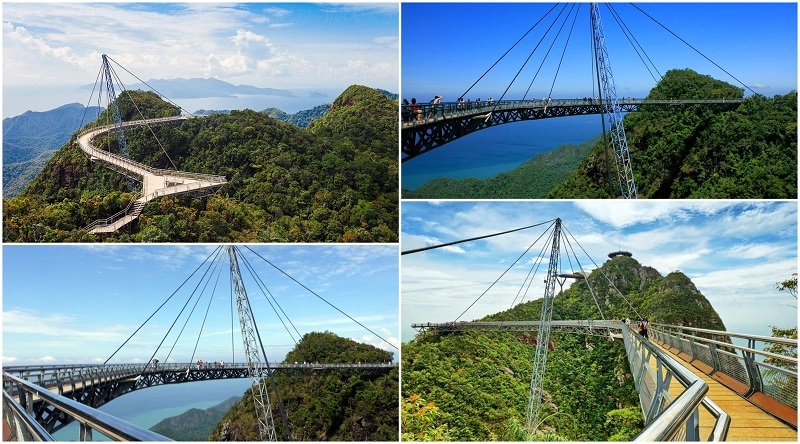 The scariest element to this bridge is that from that pylon, it swings, offering a complete panorama over the wild jungle, the Andaman Sea and the Taruto Island to its passengers. The parts were assembled by helicopter. This Sky Bridge holds the record for the longest curved suspension bridge in the world. 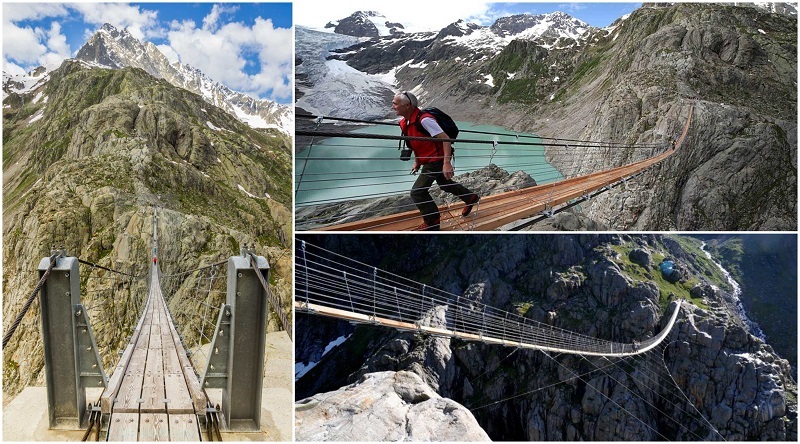 Dating since 2004, the Trift Suspension Bridge is the longest pedestrian bridge located in the Swiss Alps and was originally built for hikers to reach a hut blocked by a glacier. The experience of crossing the bridge was intensified by the wind which used to cause it to swing. Since 2009, stabilizing cables were added to prevent that. But the adrenaline rush is also delivered by the gondola ride and the passing of the river gorge, something that hikers need to do to reach the Trift Bridge. Around 20,000 people visit the construction yearly. 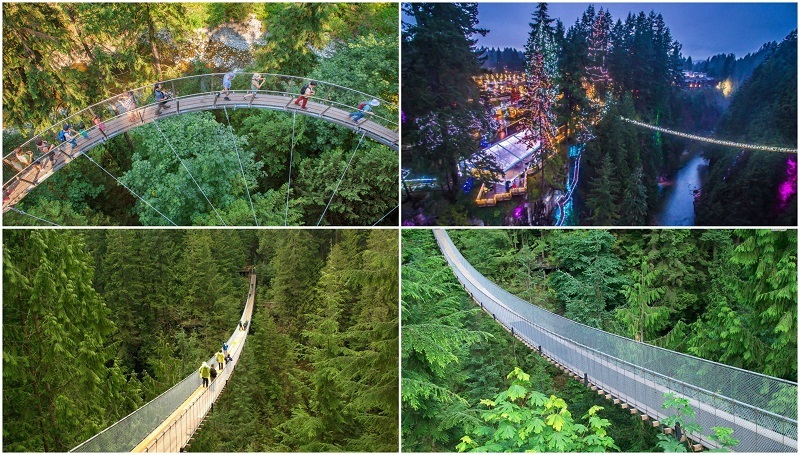 Capilano Suspension Bridge is a bridge with tradition. Originally built in 1889, this bridge leads you the Treetops Adventure Park. It is designed for passengers alone and it gives you an adrenaline rush when, as you step on it, see the cedar planks moving. Visitors have the chance to take in a spectacular view of the forest. Around 800,000 people visit it per year. Aiguille du Midi Bridge may not be terrifyingly long, but it’s located in the highest point in Europe – the massif of Mont Blanc. The glass floor which you can peek through the abyss is quite scary, but even scarier is that in order to get to the bridge, you have to take a 1955 cable car, known to perform the highest vertical ascent – 9,200 feet in 20 minutes. The name of the bridge literally means “Needle of the Noon”. Needless to say, the view is breathtaking. There aren’t many people who take on the challenge of crossing Vitim River Bridge. This bridge is a former railway, located very close to the water but which can barely fit one car at a time. Being in Siberia, the wooden bridge is covered in ice most of the year, which make it very dangerous, especially since there are no railings. 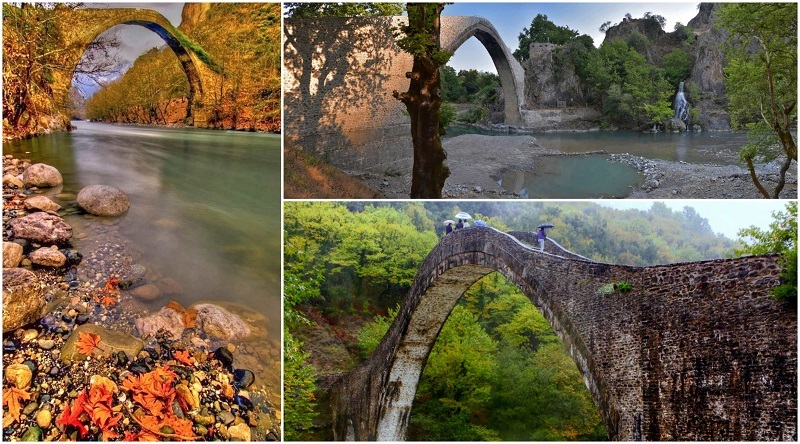 Konitsa’s Brdige dates since 1871 and it’s a beautiful rendition of the old Greek bridging technique. It has a steep slope, but it’s not very high nor very long; then what is scary about it? Right under the arch of the bridge there is a bell. When it starts ringing, it means that it is too dangerous for passengers to cross it, because of the wind coming from the valley. The Ojuela Bridge is more than one century old, but it only became a touristic attraction in 1991. Its charm comes from the fact that it leads to the mining ghost town of Ojuela. It was recently reinforced with steel, but the widely separated wooden planks still make scary squeaky sounds as you walk on the bridge. Also – you might experience a little swing while crossing it. Nothing about the Hussaini Hanging Bridge looks safe. The rope is rotten, the planks have wide gaps between them and passengers will experience a lot of swinging while crossing it. As you walk on it, you can noticed what is left of a destroyed bridge on the side. The bridge was designed as a pedestrian connection to the Upper Hunza. Once you calm your nerves, you can enjoy the nice view. Height & Length It is unknown whether the bridge hasn’t been destroyed in a moonson storm in 2011. 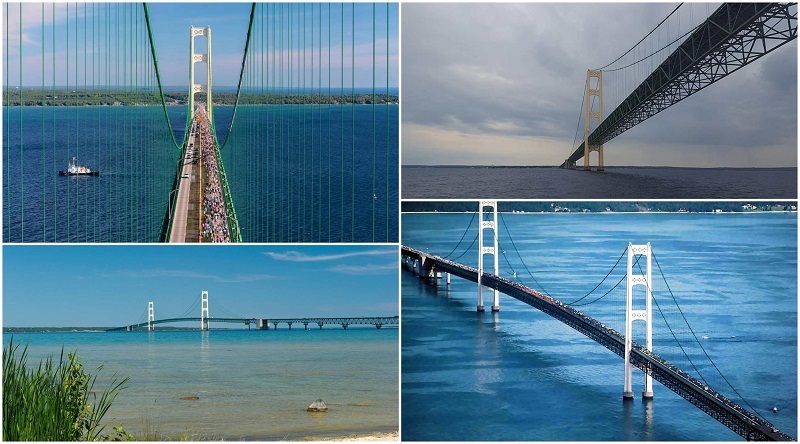 The Mackinac Bridge is a strong, majestic bridge and the fifth longest one in the world. At a first sight, nothing is unsafe about it. But suspension bridges are susceptible to any weather changes. 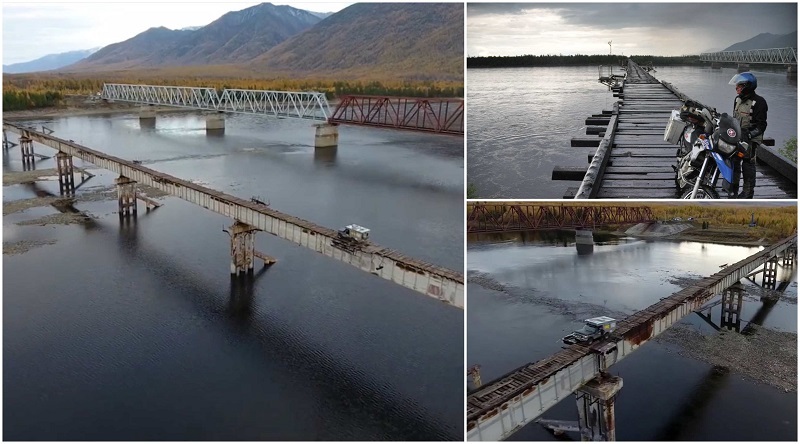 If the wind is very strong, the bridge could move as much as 35 feet, and then back again; trucks were blown away on this bridge because of the wind. Mackinac Bridge is designed for both passengers and cars. 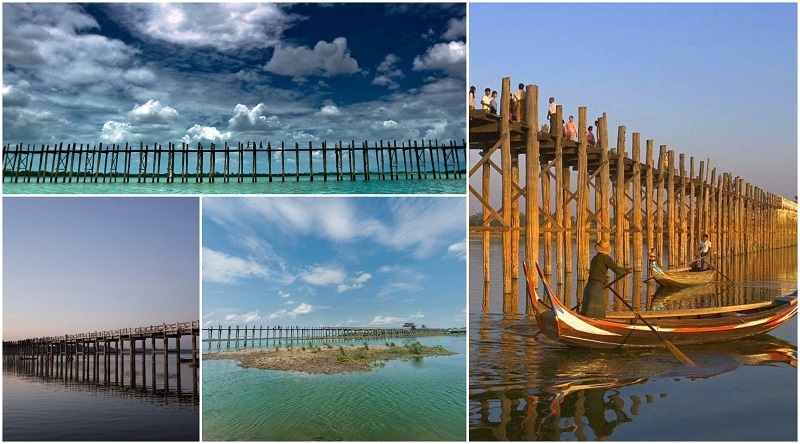 The U Pain Bridge is one of the longest wooden bridges, supported by very shaky wooden posts and with no handrails. 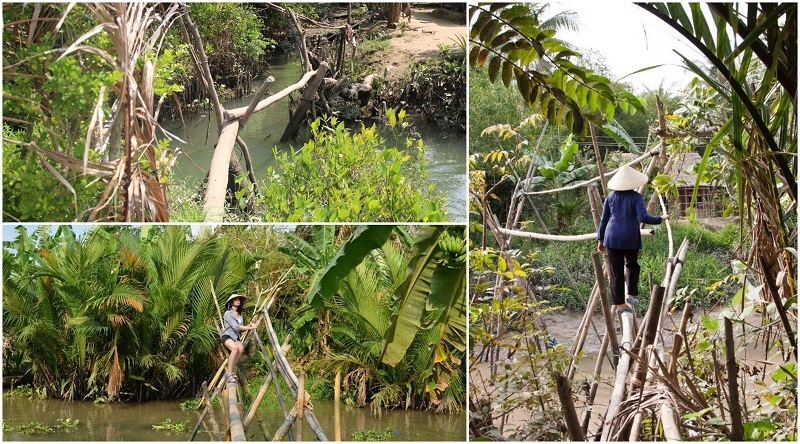 It’s as old as 2,000 years and it’s used by people on a daily basis to go the other bank of the Taungthaman Lake. The sun setting on U Pain Bridge is spectacular. The Monkey Bridges actually look like only monkeys are able to cross them, because they are both very tight, light and shaky. But in fact, these bridges were called this way because you have to assume a monkey posture when you walk on them, so you don’t fall over. For tourists, they definitely look like a challenge, but for locals this is just part of the daily routine. 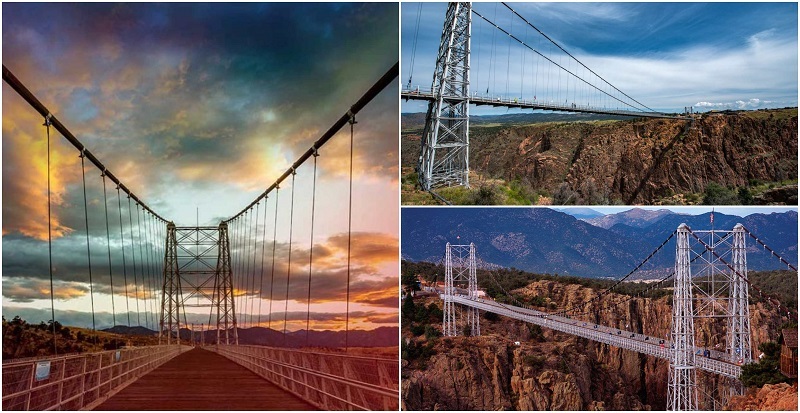 The Royal Gorge Bridge is one of the highest suspension bridges in the world and the highest in North America. The scariest thing about the bridge is the gorge underneath it, which is also known as the Grand Canyon of the Arkansas. The 90 stories high dates since 1929, but it didn’t feature stabilizing wind cables up until 1982. At the time of the construction, Sidu River Bridge was the highest in the world. For those afraid of heights, the huge gorge underneath can look quite scary. It’s less known though that Sidu River Bridge wasn’t built for transportation, so it’s not supposed to be able to carry cars. It’s simply a touristic attraction. The Hanging Bridge of Ghasa was built to ease the traffic of shepherds and their animals. The bridge is very tight and extremely shaky. Sharing the experience of crossing this bridge with a bunch of animals can increase the thrill. The extensive use of this bridge on a daily basis left it in questionable condition. 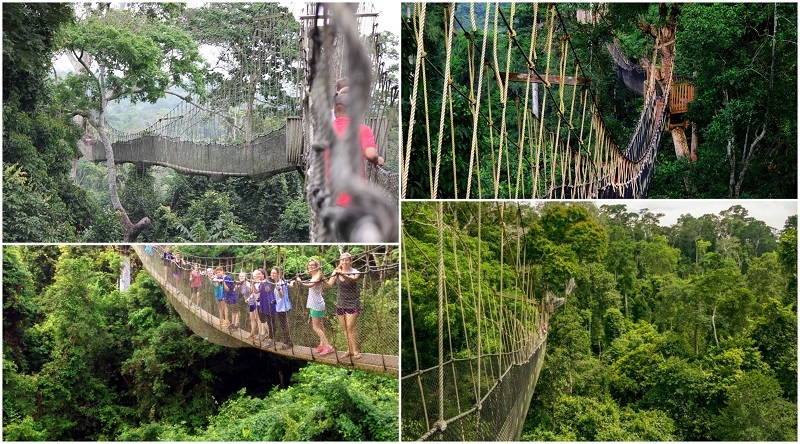 Kakum Canopy Walk is basically a very narrow wood plank, some steel bars and rope put together over the abyss. Those brave enough to walk on it will experience some bouncing and swinging. This is enough to give you an adrenaline rush, but don’t forget to count on birds and monkeys to come into your path too; it can be both beautiful and scary. The bridge is located on a jungle portion that is mostly for climbers. 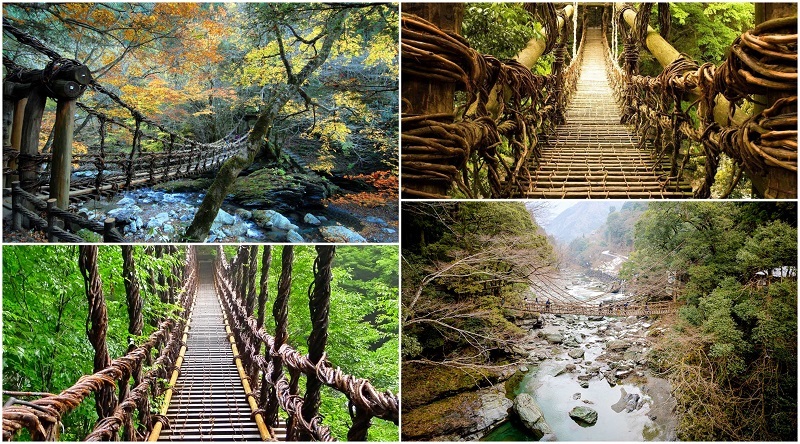 The three Iya Valley Bridges were made originally of vines alone, creating a true jungle experience for the visitors. Later, they were reinforced with wire, but with the small wood planks with big spaces between them, the swinging and bouncing, these bridges require a bit of courage to be crossed. The location is secluded and very wild and it used to be a hiding place for thieves and refugees. There are probably many more dangerous bridges around the world but thee are the one’s that stood out to us. Let us know in the comments below if you think there are other bridges that should have made it to this hazardous list! I myself drove through the Sidu River Bridge several times, and it’s in fact part of the main highways across China. So it’s completely nonsense that this bridge is not supposed to be able to carry cars. Also, it’s really ridiculous to spend over $100M for ‘a tourist attraction’.